Successfully Added Dome Camera with 3 Wide Angle 1/4 inch Sony CCD Cameras - PAL (Motion Detection, Night Vision) to your Shopping Cart. 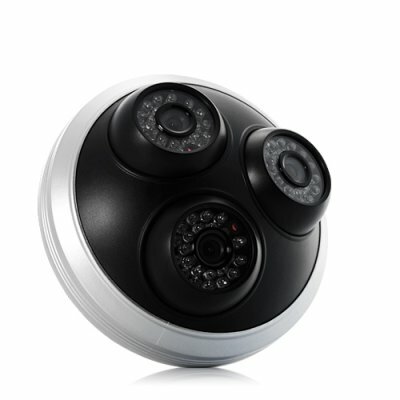 Keep an eye on your home or business easily with this super dome camera that comes with 3 wide angle ¼ inch Sony CCD cameras. Featuring state of the art surveillance technology, this powerful beast has not one, not two, but three separate 360 degree rotatable cameras installed on its durably constructed base plate. All three cameras use ¼ inch Sony CCD image sensor with 24LED IR to offer you day and night complete surveillance of any place where you install it. It’s extremely easy to set up. Unlike installing three security cameras separately which costs you huge amount of money and time, installing this baby up can be done in less than 30 seconds! Simply hook it up with your monitor through the AV cable, connect to the power, and you are done! Best of all, if you need a license to install security cameras in your country, instead of applying for three licenses, now you only need one to install THREE cameras!!! This camera displays images in three windows on your display to give you a 360 view of your home or business. The image quality is just incredible. Colors are vivid to make everything look so real on your monitor. What’s better, when one of the cameras detects a motion, it will enlarge its image to full screen to give you a clear view of what’s going on. Designed to look ultra simple and perform to meet your every surveillance need, this dome camera is your ultimate choice for home or business security. Now in stock for immediate shipment from the leader in direct from factory electronics, Chinavasion. Also comes with our famous 12 month product warranty. Do I need three licenses to install this camera? NO, and that’s why you should buy this camera. This camera is in fact three cameras in one unit so you spend a fraction of the price, and install three cameras with only one license (if your country requires license to install cameras). No, you don’t! This camera has a light sensor that detects light levels. It switches to IR mode automatically. Is this Camera easy to set up and use? Absolutely! One of our easiest!